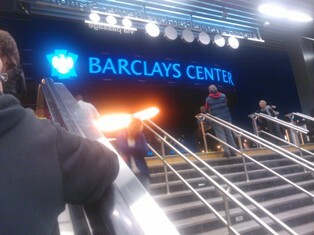 The Barclays Center is connected through 11 subway lines, so it is an extremely accessible arena. The best part was that right as you’re coming up the stairs or escalator, the arena slowly comes into view with each step. It really drops you off right at the doorstep. Outside the arena it looks really well done in terms of its architecture. As for the rusty painted panels, it looks kind of weird but for some reason it felt like it worked for the way the building was. As they let us in, I walked the halls before heading up to my seat. There were ample concession stands as I made the 10 minute walk around. As they let us into our seats and I took the steps to the seats, it was a beautiful stadium. 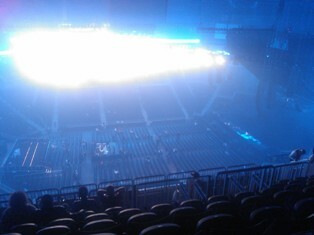 I was in the upper bowl and it’s near vertical seating. I think this was done so that each seat has a clear view of the floor. 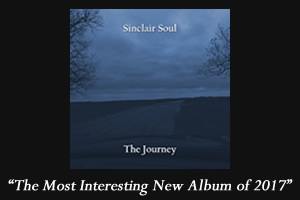 Also from the way that it was constructed, the music sounded really well. After another hour or so, the lights dropped and he emerged from the stage. Surprisingly he didn’t have an opening act and no guests except for one. One person he mentioned that wasn’t singing along with him was Jackie Robinson’s wife! I thought it was nice that he announced she was here. The show started off with a video clip showing significant events in Brooklyn’s past, ranging from when it got recognized as a borough to when the Barclays Center officially opened. His first three songs were Where I’m From, Empire State of Mind, and Brooklyn Go Hard. It was fitting he started off with songs dedicated to his home. The energy was high right away; and it reached its peak during Brooklyn Go Hard. I really felt the music and roar of the crowd pulse through me and I got picked up and became part of it. He really made everyone feel like they were welcome. He then paid tribute to Biggie and other Brooklyn legends. Jay even got the crowd to sing to Biggie’s Juicy. 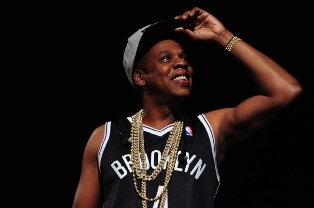 For a 42-year old rapper, it amazed me how he was able to command 19,000 people to bounce with him and throw the diamond up on several of his songs. Staples like 99 Problems, Dirt Off Your Shoulder, and Big Pimpin, among several others, were all part of his set list. After a rendition of Bonnie and Clyde his wife, Beyonce, came out and performed. And from what I found so far, this was the only night that she came out. 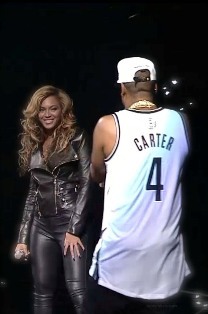 It was crazy to see her on stage, and at one point the both of them were on stage performing Crazy in Love. Although Jay would admit to coming back out on stage late because he was watching Beyonce perform on the monitors backstage. After this, he went further back in his music catalogue and apologized to fans that only started listening to him around The Blueprint 3. With that he went through Dead Presidents II, Public Service Announcement, Heart of the City, Hard Knock Life, and Encore. While I was singing and bouncing along with the beat through each of these songs, I did notice that the people around me weren’t as into the show. They were just doing the obligatory head bop to each song. This disappointed me a tad, but I didn’t mind and I just sang even harder while my voice cracked a few times. 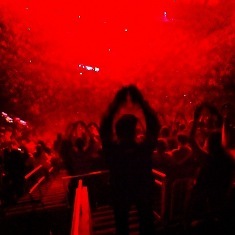 Before he performed Encore, he took the time out to look at the people in the upper bowl and pointed out some of them. This was another touch that made the show seem more personal. After Encore he went backstage for a bit, the crowd chanted Hova, and before we knew it he was back out asking if we wanted more. With a resounding roar from the crowd, he came back out with an outfit change. The main songs I knew were Izzo(H.O.V.A. ), Jigga What, Jigga Who, Excuse Me Miss, and finally Young Forever. Unfortunately, this second set felt like it went faster. Still, with each song, the crowd realized it was ending, and picked up the energy and Jay smiled bigger than before. Before he performed Young Forever, he acknowledged the crowd again and thanked us and told us to achieve what we set out to and don’t let outside noise distract you. With that, the lights shut off and Beyonce sang the chorus of Young Forever. As she sang the lights slowly came back on. Jay-Z would perform his verses from the song while he and Beyonce shared a hug and maybe a kiss on stage. With that, the show was over as the pair exited the stage. I filtered out of the stadium and was herded to the subway back to Manhattan; and subsequently the ferry back to Staten Island.